To receive discount on your card, the card needs to be topped up with money. 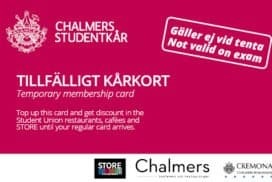 You can top-up your card either on-line (lowest charge 200 SEK) or in one of our staffed control points (lowest charge 400 SEK). Register your card on-line with name and e-mail on the first time topping up your card. When your card is topped up, you can receive our offers and use our “fast track” tills. Choose the type of card that is equivalent to the one you want to top up! We care about your integrity, we want you to feel confident when you share your personal data with us and we apply the current data protection law. It is important to us that you are aware of how we will use your personal data, what we will use it for, who will be able to take part of it and under which circumstances you can take advantage of your rights. We will use your personal information in order to fulfil our obligations to you as a customer. Our objective is to not process more personal data than we believe is necessary for the purpose and we always strive to use the least sensitive personal information. When you register your card you also consent to us registering your personal data according to below information. If you charge your card in any of our cash desks it is possible to use your card without registering your personal data. If you choose not to register your card we will not be able to lock your card in case of loss. When you register your card we will register your name and email address in our cash register system. We use your personal data in order to send you a receipt when you charge your card, to send you account statements, to lock your card in case you lose it and in order to communicate information that we believe will be of your interest (for example changed opening hours or new/changed units connected to the card). We will not pass on personal data to any third party except from those authorities where we have a legal obligation to do so. The personal data will only be processed by the employees who need access to the data in order to carry out the work related to our customer relation. For how long will your information be saved? The personal information will be kept for five years from the last time you used your card. If you consider that we are misusing/have been misused your data please contact Datainspektionen. Datainspektionen is an authority which, through its regulatory activities, shall work to prevent the handling of personal data from intrusion in individual’s personal integrity. To be able to charge your card over the Internet requires that your bank card is connected to 3D Secure. You do this on your internet banking. 3D Secure is a security payments with Visa or MasterCard online. 3D Secure is also known as Verified by Visa and MasterCard SecureCode. 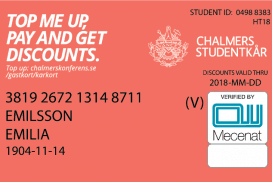 For any further information concerning payment, please contact us at support@chalmerskonferens.se. Coffee and a selection of other products are also discounted both at Café C and Kokboken. You have discounts on the whole of our Go Fresh Range. At Wijkanders you receive 20 kr at lunch dishes and 20% discount on all food & beverage at evening menus. You have discounts on a selection of products both at STORE and Kokboken. Linsen, Bulten, Café Sigurd & Hedvall. Discounts on a selection of products. Please contact them directly for more information.